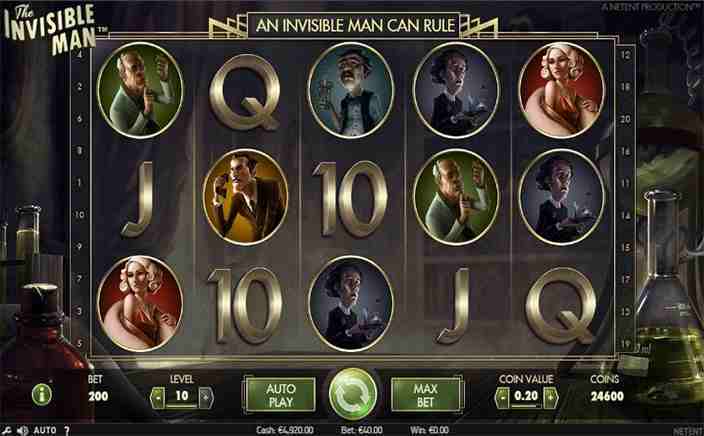 The leading video slot game developing company NetEnt is back with another exciting slot game “The Invisible Man”. This installment of NetEnt is inspired from 1933’s famous movie with the same name. This slot game is a 5-reel and 20-payline typical NetEnt slot in which you can invest 20p-£100 per spin. Of course, the winning amount will be quite higher when you land on the winning sequence of symbols. This game has wilds, scatter and some interesting bonus features that can turn any loss into profit. This video slot offers re-spin round, free spin round and wild substitution features, which make it a great choice for winning real money online. What makes The Invisible Man special? Unlike other video slot developers, NetEntertainment always takes care of using quality graphics and that’s what it did in The Invisible Man slot game. Of course, the theme of the game is taken from 1933’s movie and 1897’s novel, but modern graphics make it a modern slot. HD graphics and symbols with some amazing bonus games make this slot the first choice for every online slot game lover. The plot of this slot is such that the scientist is aiming to become invisible and take advantage of invisible life, but he is facing problems. You spin the slot machine and enjoy the game with that scientist and some luring rewards come out during this gameplay. The bets start from 20p and the maximum bet you can apply per spin is £100. You can win from both sides and that’s how your chances of earning more prizes increase in this game. Why you must play this game? 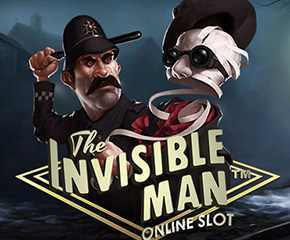 You must play The Invisible Man slot because it has some great bonus games, which you would rarely find in any other online video slot. The police wild lands on reel number 1 and Griffin wild lands on reel number 5. Police wild replaces all nearby symbols to form the best winning sequence and Griffin wild shifts one place left before you spin again. When police wild and griffin wild appear at the same place, they become one wild to reward a better price and free spins. The burning wilds land during police spins and act as a normal wild symbol. Police spin bonus round can get triggered if the police spin meter is complete. You get 3 spins and 5 wild symbols randomly placed during this round. And with this, your winning opportunities are increased. If the free spin round is activated and bonus game meter is completely filled up, Griffin Rage bonus round will get triggered. You click at 5 items to unlock hidden bonus behind them. This is what you get in this round with the multipliers. The Invisible Man slot has eye-catching graphics and an interesting theme that every video slot game player expects for good entertainment and better wins. You can play it online without downloading and earn up to £5,000.